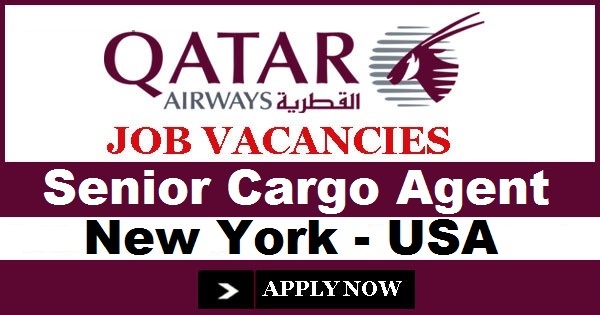 About Your Job: As a Senior Cargo Agent based in New York, you will provide assistance in generating maximum cargo sales in order to meet or exceed the set revenue / tonnage target for stations and to provide customer services in Sales and Operational areas liaising with Customers. You will also liaise with Ground handling agents at the station, other US stations, USA finance department and with the head office in Doha. You will also be required to maintain a close coordination between QR Space Control and customers by ensuring their shipments are transferred, delivered on time. in a similar capacity. Exposure to Cargo operations, logistics and sales, Knowledge in Cargo Marketing, Basic rating,Dangerous Goods Regulations and a fair knowledge of IATA/TACT regulations would be preferred. Candidates should possess computer skills (able to type at least 30-40 wpm), proficient in excel , word and outlook, possess strong geographical knowledge, be a team player to accomplish Corporate goals , Good phone manners, good communication skills and needs to be able to multitask in a fast pace environment. Exceptional customer service skills is an absolute must for this role. You will need to be legally eligible to live and work in the USA (relocation assistance is not provided).